Ambulyx placida Moore, 1888, Proc. zool. Soc. Lond. 1888: 390. Type locality: Nortwest India, Himachal Pradesh, Solon [Solan]. Synonym. Oxyambulyx citrona Joicey & Kaye, 1917. Synonym. Ambulyx placida nepalplacida Inoue, 1992. Wingspan: 104-114mm. A very pale species, but underside of wings a deep chrome. 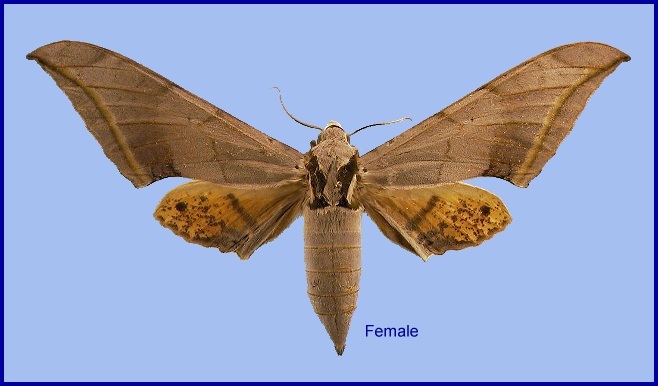 Similar to Ambulyx semiplacida, but distinguished by the much smaller subbasal spot on the forewing upperside (spot rarely present as a minute dot and even, in one female, absent) and the stronger abdominal sternum 8 of the male. Abdomen with fine mesial line; no patch on eighth tergite. 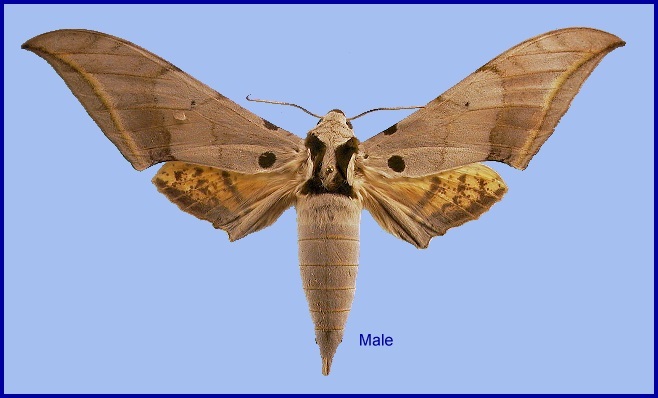 In the male genitalia, sternum A8 lobed mesally, toothed or not toothed at angles; lobes stronger than in Ambulyx sericeipenis. Gnathos deeply sinuate, the two lobes rounded. Harpe with ventral process shorter than that of Ambulyx montana with apex of ventral process directed downwards and dorsal margin irregularly undulating or dentate. In the female genitalia, colliculum shorter than in Ambulyx semiplacida, strongly sclerotised and with aperture deeply hollowed. Ductus bursae very short. Corpus bursae: signum a dentate sclerite, narrowing anteriorly. China: Xizang/Tibet (? ?Pakyong, 5000'). Records from other parts of China are erroneous and refer to either Ambulyx regia or A. interplacida Brechlin, 2006. The Himalayan foothills of northern India, Nepal and Tibet.